Dascyllus trimaculatus, the Three Spot Domino fish, is actually quite neat though it is territorial and a bit aggressive. Dascyllus is a genus of fish in the family Pomacentridae. It is quite a small fish as it grows only up to 13 cm in length. You recognize the fish for the three white spots, of which one can though sometimes be absent. 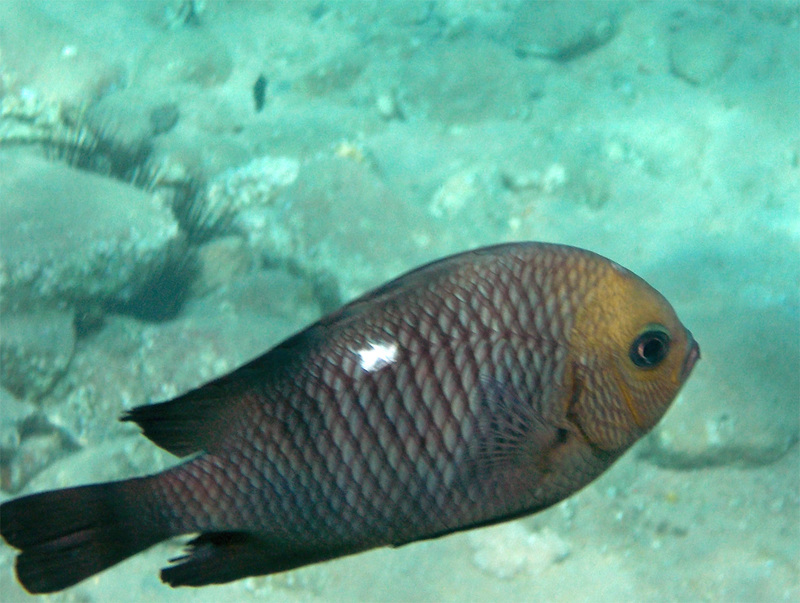 The Halfmoon or Flagtail triggerfish, Sufflamen chrysopterus, is very beautiful with its black velvet like colour. The tail is white and yellow, as you can see in the picture above. It can grow up to 30 cm in length. 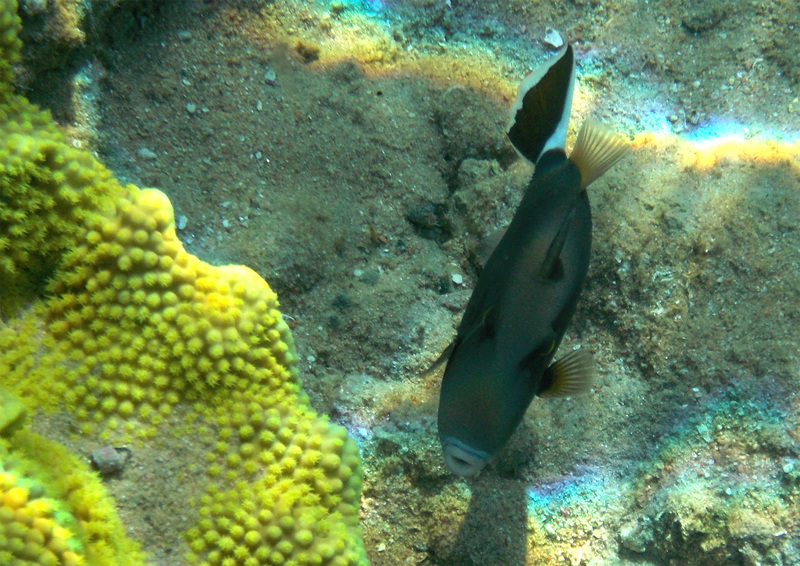 This triggerfish feeds on a variety of invertebrates and the occasional small fish. A small Lionfish, Pterois Volitans, swims above the triggerfish (in the above picture). Can you see it? It is just a baby and the colouring is white, beige and brown. The Lionfish is part of the Scorpionfish (Scorpaenidae) species, which take their name from the venomous spines positioned on the dorsal fin. Ostracion cyanurus, the Arabian boxfish, is only 15 cm as an adult. It likes to swim close to the bottom We suddenly saw one below us and took this photo. 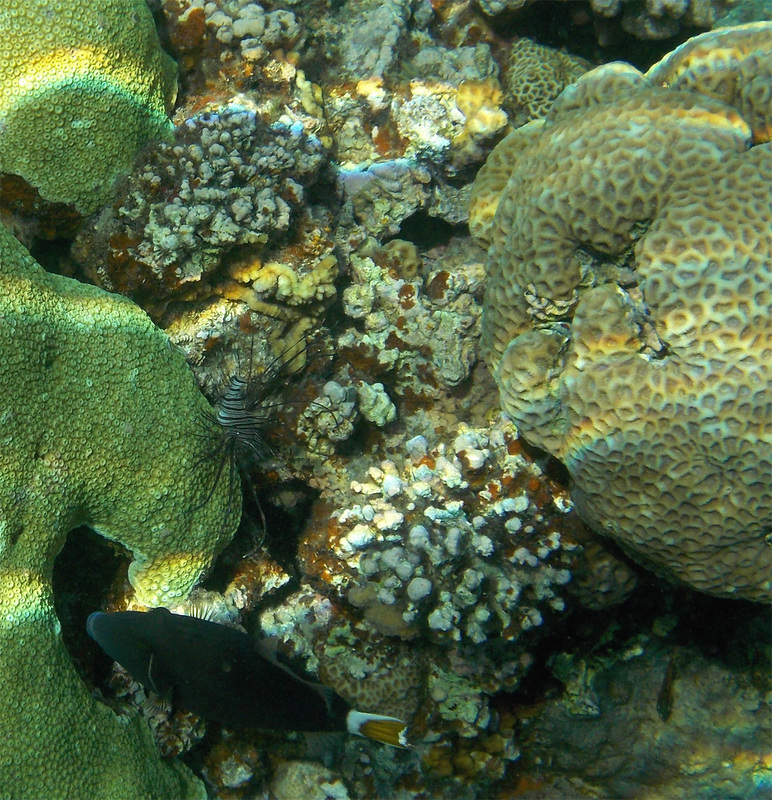 The Arabian boxfish inhabits areas of moderate coral growth and is usually found close to shelter. Ostracion meleagris, the Black or Spotted boxfish, explores the bottom of the Red Sea on the bottom of this photo. The male is more colourful than the female. The colouring can be blue to black and the dots can be white or black. The female is dark with white spots. This boxfish does not grow past 25 cm. The one we saw was only about 20 cm in size. 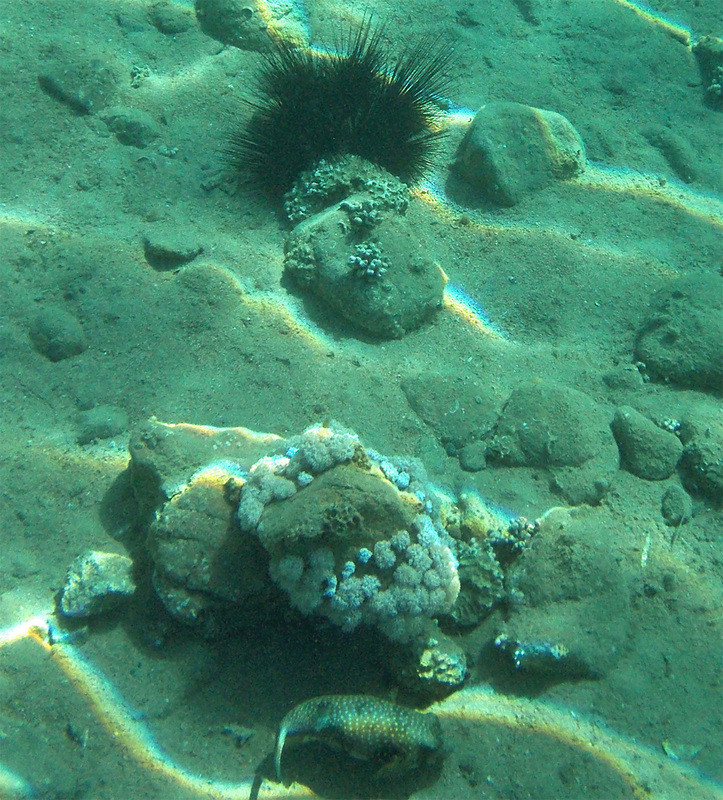 The Black sea urchins at the top of the photo are fabulous. But remember to keep your distance from them. Keep your feet off the bottom. The Red Sea Clownfish, also known as the Twobar anemonefish, Amphiprion bicinctus, is one funny and beautiful fish. 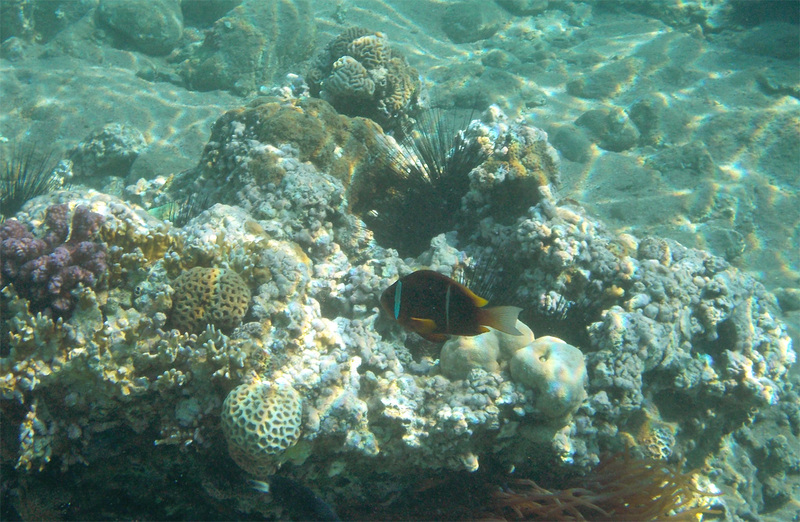 It is one of the most common Clownfish in the Red Sea. It can grow up to 14 cm, but is usually smaller.